Written by Nancy P. Jenster, Abbie and the A -team is an interfaith family musical that ​follows the dramatic unfolding of the story of Abbie and her family in their struggle to forgive and move on from an unfortunate event in the past. Anna played the part of the mother, Catherine, in the World Premier Performance on May 5, 2018 directed by Nicole Stinton (AUS). Anna wrote the script "Happy" for submission to Short + Sweet Theatre Penang 2017. This 10-minute play is directed by Alvin Looi. Shows are on 8-11 Nov (Wed - Sat), 8.30pm at stage 2, penangpac. To celebrate their 25th anniversary, and to benefit the Tenaganita Women's Shelter, the Penang Players Music and Drama Society presents Richard Greenberg’s Three Days of Rain. Spanning two generations, Three Days of Rain is a heart-warming, and sometimes tragically funny, examination on family connections and the inherent loneliness of being human. Three Days of Rain was staged with an international cast at Stage 2, Penang PAC, Straits Quay, on 27-28 October 2017. "W;t, a play written in 1991 by Margaret Edson, made its world premiere in 1995, in California. It was adapted into a movie for television which won several Emmy awards and was nominated at both the Screen Actor’s Guild and the Golden Globes. W;t is as relevant today (if not more so) in our hectic, insular, ivory tower lives, where technology substitutes human interaction and striving for excellence tramples all else. The protagonist, a renowned professor, is forced to reassess her life when suddenly she is no longer in control. She reﬂects on her life through the intricacies of the English language and her talent for wit and, ultimately, realizes that hope lies in kindness alone. W;t was staged with an international cast at Stage 2, Penang PAC, Straits Quay on 16 June 2016 & 17 June 2016. Photos are now up HERE, courtesy of Claude Debeauvais. On 28th November 2014, Anna participated in a George Town Literary Festival (GTLF) program called Voices: The Realities of Women. This storytelling session, followed by a Q&A, was the culmination of a women’s writing programme run by PWDC (Penang Women's Development Corporation). Hear the stories that were written during the programme – stories of women from the local community who were interviewed by the writers of VOICES. Just as varied as the women who call Penang home, these are their unique stories. Anna was one of the four women writers who wrote a 2,000-word piece and read it during the festival. In 2011, a staff member at Penang Christian Center (PCC) called together a group of creatives and said, "Let's do something." Out of that, A Place to Call Home was born. Anna wrote the screenplay, which revolves around the adoption of Daniel (played by Adrian Nonis) into the Lee family (played by Stephen Tor and Josephine Goh). Anna also co-wrote the lyrics with the three song writers and co-directed the musical drama. The musical drama was staged in PCC's main hall on 10th and 11th of August 2012. Watch it here. Anna had the privilege of working with Broadway veterans Michael Parks Masterson and John Ferguson in the YES Broadway Academy in June 2012, culminating in two Gala performances on 16th June 2012. The YES (Youth Excellence on Stage) Academy is a joint non-profit production of the US-based non-profit organization, American Voices and the George Town Festival and was sponsored by the U.S. Embassy, Kuala Lumpur, The George Town Festival and the Association of American Voices. ​Watch the performances: Sweeney Todd and Lion King. 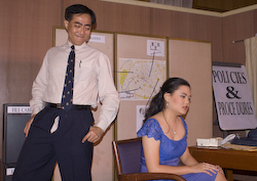 Anna acted in another dinner show by the Penang Players in January 2011, featuring two plays. The Indifferent Commissioner (Georges Courteline) featured Philip Yeoh, Anna Tan, Henry Loh, Lim Yao Han, Eric Yeoh, Leonard Ooi and Mike Tan. Stop Parading Around Stark Naked! (Georges Feydeau) included Murali Ram, Shamila Ariffin, Larren Heah, Henry Loh and Lim Yao Han. In 2009, Penang Players staged a dinner show with 3 one-act plays: Blind Date (Mal Andersen), Calling It Quits (Mal Andersen) and Inconvenient (Paul Hannah). Anna acted in Inconvenient People alongside Lucille Dass and Ian Kerr. 2004 saw Anna enjoying the bright city lights of Kuala Lumpur, where she got involved in Sidang Injil Borneo (SIB) KL's production, Drunk Before Dawn, which tells the story of the work of early Christian missionaries amongst the Lun Bawang tribe in Sarawak. Together with her childhood friend Josh Yeoh, Anna wrote the script for Star of Persia based on the biblical story of Esther for their youth group's annual Family Night. 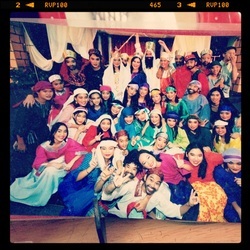 The musical drama, with songs written by Josh, was staged in FGA Centre's main hall on 1 - 3 May 2003. Besides co-directing, Anna played the main role of Esther in this hour-long production.